Cardiovascular diseases remain the leading cause of mortality worldwide, and acute myocardial infarction (MI) is a common and morbid event in patients with cumulative cardio-vascular risk factors1. However, the number of deaths caused by acute MI diminished since the expansion and increased accessibility to primary percutaneous coronary interventions (PPCI)2-4. Left ventricle thrombus (LVT) is a possible complication in patients with acute MI, with an incidence of 1.6%, even if treated with PPCI6. The highest incidence of LVT is during the fi rst 5 days after the acute event5,6. The likelihood of developing LVT is higher in patients with large anterior myocardial infarction with ST seg-ment elevation (STEMI), especially in those presenting anterior-apical aneurysm2,6,12. Thromboembolic events associated with LVT, such as embolic stroke, remain feared complications, with poor outcome2. Hereby, we present the outcome of 3 cases of acu-te anterior STEMI, complicated with LVT, even though PPCI was performed. Triple therapy, with anticoagula-tion and dual antiplatelet treatment, was started on all three cases. However, one patient developed embolic stroke, with complete resolution of the neurologic de-ficit after one week of maximal treatment. Anticoagu-lation was discontinued after LVT resolution, and no bleeding events were present. A 44-year-old male, known with type 2 diabetes and dyslipidemia, presented to a regional hospital with an-terior STEMI, 6 hours after significant chest pain on-set (first episode in life). He received standard dual antiplatelet therapy (DAP, Aspirin and Clopidogrel) and thrombolytic therapy (Tenecteplase), and then he was transferred to our Cardiology Department to perform emergency coronary angiography. Coronary angiography revealed a 95% stenosis of the left ante-rior descending artery (LAD), with no other critical lesions. A drug eluting stent (DES) was implanted, wi-thout peri-procedural complications. The time betwe-en onset of symptoms and rescue PCI was 12 hours and 43 minutes. The second patient was a 40 years-old man, trans-ferred to our department for anterior STEMI. Symp-toms debut was 72 hours prior, but their intensity increased in the last 24 hours before admission. Emer-gency transthoracic echocardiography (TTE) showed apical dyskinesia and LVT. He was started on dual anti-platelet therapy with Aspirin and Clopidogrel and pre-pared for emergency coronarography. The coronary angiography showed single vessel coronary artery di-sease, with complete occlusion of the proximal LAD. Two DESs were implanted, with optimal procedural result and without complications. The time between the transfer of the patient and primary PCI was 3 hours and 30 minutes. The third patient, a 42 years-old man, presented to our department with recurrent anterior STEMI. He had a history of anterior STEMI 8 years ago, when he was diagnosed with single vessel coronary artery disease and received a bare metal stent (BMS) in the proximal segment of the LAD. He continued smoking and interrupted his medication one week before the onset of symptoms. Emergency coronary angiography showed acute thrombotic occlusion of the proximal part of the BMS. Consequently, a DES was implanted at the level of proximal LAD, with good procedural result. The duration between the onset of symptoms and PCI was 4 hours. After procedure, all 3 patients received standard dual antiplatelet therapy with Clopidogrel and Aspi-rin. TTE performed during the first 48 hours after the procedure revealed LV spontaneous echo contrast and apical LVT. Anticoagulation with low molecular weight heparin and Acenocumarol was started in all 3 patients, until a therapeutic INR (2-3). Patients were discharged on Acenocumarol and DAP. Extensive laboratory work-up for a hypercoagu-lability state were negative in the first two patients. Conversely, the third patient was positive for hyper-homocysteinemia and mutation A1298C, in a hetero-zygote form. After one week of correct anticoagula-tion, he developed ischemic stroke. Brain computed tomography, Doppler ultrasound of cervico-cerebral arteries, and 24-hours Holter ECG monitoring were performed. Carotid atherosclerotic plaques and atrial fibrillation were excluded, and the LVT was pointed as a source of the cerebral embolism. Consequently, standard treatment with antiplatelet therapy and oral anticoagulation were continued, and the patient pre-sented recovery of the neurologic deficit within one week. Thus, all 3 patients followed triple therapy with Aspirin, Clopidogrel, and Acenocumarol, for 90 days. Three-month follow-up showed improvement of the LVEF and the resolution of LVT in all three patients. Therefore, oral anticoagulation was stopped, while DAPT was continued for 12 months, then followed by low dose of Aspirin (100 mg o.d.). At 2 years follow-up, all 3 patients were free from any cardiovascular or cerebral events. Blood stasis, secondary to dyskinesia and wall motion abnormalities, subendocardial tissue injury, and various inflammatory factors contributing to a hyperco-agulability status, were all incriminated in the mecha-nism of MI complicated with LVT2,4,7-9. There is a li-mited number of studies addressing the occurrence and possible complications of LVT after myocardial infarction. A recent retrospective study conducted by Mao et al. on 1698 patients with MI showed the presence of LVT in 28 cases (1.6%). They showed that intervention on LAD was independently associ-ated with LVT, while a a higher LVEF was associated with a lower incidence of LVT6. An interesting study by Osherov et al. showed that the presence of LVT is similar in patients with MI receiving all types of treat-ment: thrombolysis, interventional, and conservative treatment11. They analyzed 642 patients and separa-ted them in three groups: PPCI group, thrombolytic group and conservative treatment group. The rate of LVT after anterior MI was 6.2%, with no statistical di-fference for the LVT rate according to treatment: 21 (7.1%) of 297 patients in the PPCI group, 10 (7.8%) of 128 patients in the thrombolytic group, and 9 (4.1%) of 217 patients in the conservative group (p=0.28)11. Another prospective study by Rehan et al. analyzed 92 patients with STEMI, treated with rescue or facilitated PCI. Four patients (4.3%) developed LVT, diagnosed by using unenhanced and enhanced imaging with Per-flutren lipid microspheres. All 4 patients had STEMI involving LAD and a mean LVEF of 31%. Despite all these evidences, the incidence of LVT is lower in the “PPCI era” by comparison to the „pre PPCI era”, when only thrombolysis was used in pa-tients with acute MI18. For example, in the GISSI-2 study, conducted by Vecchio et al. in 1991, the LVT was observed in 51 of 180 patients (28%) with anterior acute MI, receiving thrombolysis with streptokina-se or recombinant tissue-type plasminogen activator (rt-PA). The study described only one embolic event during hospitalization19. The incidence of LVT diminished after the introduction of interventional therapy. The Fragmin in Acute Myocardial Infarction (FRAMI) Study evaluated efficacy and safety of Dalteparin in the prevention of arte-rial thromboembolism after an acute anterior MI, and showed that Dalteparin is associated a lower risk of LVT formation, but a higher risk of hemorrhage. They observed a risk reduction of LVT in the Dalteparin treatment group of 0.63 (95% CI: 0.43-0.92, p=0.02)20. Solheim et al. showed that patients with LVT, trea-ted with DAP therapy and PCI, have a higher peak creatinine kinase levels, larger infarct sizes, and lower LVEFs, assessed by TTE or single photon emission computed tomography10. The main complication of the LVT is embolic stro-ke. In 1989, Jugdutt B. addressed the possibility of embolism in patients with LVT, emphasizing specific characteristics, such as thrombus mobility and pro-trusion, and the presence of adjacent hyperkinesia9. A more recent study described a stroke risk algori-thm for patients with MI without atrial fibrillation15. Algorithm criteria included: older age, Killip class 3 or 4, hypertension, reduced LVEF (<35%), and estimated glomerular filtration rate <45 ml/min/1.73 m2. Using this score, patients who have at least 3 points have similar risk of having stroke as those with atrial fibrillation15. Management of embolic stroke following LVT va-ries from thrombolysis therapy to anticoagulation with heparin2,3,8,9. Vitamin K antagonist have been also recommended, but without being studied in large ran-domized studies. In 2013, the ACCFAHA released a recommendation for the introduction of warfarin in STEMI patients who develop mural LVT21. Non-vita-min K oral-anticoagulants do not have evidence-based indications in patients with LVT. However, there are few case reports of patients with mural LVT, which were treated with new oral anticoagulants such as Apixaban, Rivaroxaban or Dabigatran, with successful results22-25. Another important aspect is the duration of the anticoagulant therapy in patients with LVT, so far scarcely studied. General consensus is that clinical and imaging follow-up at 1, 3, and 6 months should be performed in all patients with LVT. After 6 months, if LVT is excluded by TTE, and no other indications pre-sent, the anticoagulation therapy should be stopped13. According to the ESC guidelines, patients with LVT after MI should receive oral anticoagulation for at least 6 months13. Current ESC guidelines recommend the association of DAPT to oral anticoagulation therapy for a minimum period of one month, which can be prolonged up to 6 months, based on the bleeding risk. However, these recommendations refer to patients with atrial fibrillation, and there are no clear recommendations for patients with LVT17. Figure 1. Apical 4 chamber echocardiographic view of the left ventricle. 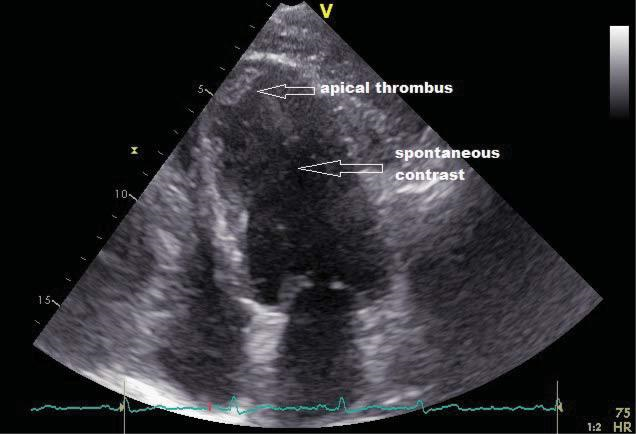 Presence of a thrombus attached to the apex and the interventricular septum of the left ventricle and spontaneous contrast, after myocardial revascularization (first patient). Figure 2. Apical 4 chamber echocardiographic view of the left ventricle. 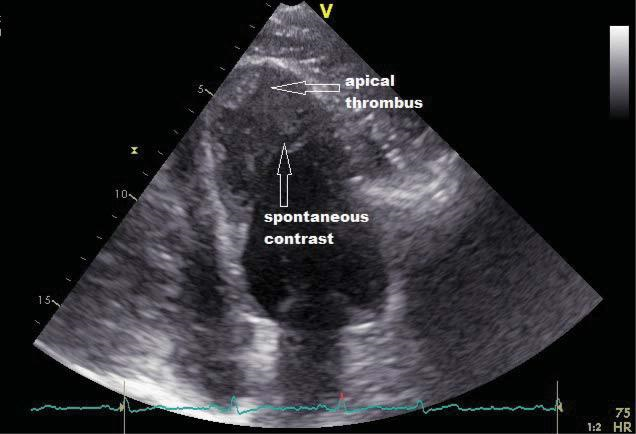 Presence of an apical thrombus and spontaneous contrast into the left ventricle, after myocardial revascularization (second patient). Figure 3. Apical 4 chamber echocardiographic view of the left ventricle. 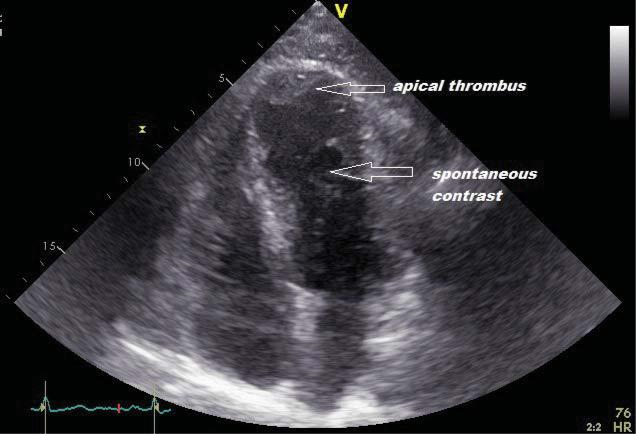 Presence of thrombus and spontaneous contrast at the level of the apex of the left ventricle, after myocardial revascularization (third patient). Left ventricular thrombus is a complication occur-ring mainly after anterior acute myocardial infarction, even if complete revascularization is performed. We suggest that, in all patients presenting with anterior MI, repeated echocardiography should be performed until discharge, in order to exclude left ventricu-lar thrombus. If left ventricular thrombus is present, patients should undergo anticoagulation treatment associated with dual antiplatelet therapy, for a mini-mum of one month, optimal until the resolution of thrombus. Risk of hemorrhage should be periodically assessed and therapy adjusted accordingly. Our cases showed resolution of left ventricular thrombus after 3 months of triple therapy, in three random cases of young males with anterior myocardial infarction that received interventional treatment, without bleeding events. Embolic events can occur also in the presence of triple therapy. 1. World Health Organization. Cardiovascular Diseases – Fact sheet N°317 [updated May 2017]. Available from: http://www.who.int/me-diacentre/factsheets/fs317/en/. 2. Delewi R, Zijlstra F, Piek JJ Left ventricular thrombus formation after acute myocardial infarction. Heart 2012; 98:1743-9. 3. Kaikita K, Soejima K, Matsukawa M, Nakagaki T, Ogawa H. Serial changes in von Willebrand factor cleaving protease (ADAMTS13) and prognosis after acute myocardial infarction. Am J Cardiol 2007; 100:758-63. 4. Merlini PA, Bauer KA, Oltrona L, Ardissino D, Cattaneo M, Belli C, Mannucci PM, Rosenberg RD Persistent activation of coagulation mechanism in unstable angina and myocardial infarction. Circulation 1994; 90:61-8. 5. Slicker K., Oyetayo O., Lane W., Langsjoen D., Mack R., De La Rosa L., Patel C., Chiles C. Time to discovery of left ventricular thrombus after anterior infarction with reduced ejection fraction treated with percutaneous coronary intervention and dual antiplatelet therapy. J Am Coll Cardiol 2015;65(Suppl): A250. 6. Mao TF, Bajwa A, Muskula P, Coggins TR, Kennedy K, Magalski A, Skolnick DG , Main ML. Incidence of left ventricular thrombus in pa-tients with acute ST-segment elevation myocardial infarction treat-ed with percutaneous coronary intervention Am J Cardiol, Elsevier, 2017, 121:27 – 31. 7. Asinger RW, Mikell FL, Elsperger J, Hodges M Incidence of left-ven-tricular thrombosis after acute transmural myocardial infarction. Se-rial evaluation by two-dimensional echocardiography. N Engl J Med 1981; 305:297–302. 8. Visser CA, Kan G, Lie KI, Durrer D Left ventricular thrombus fol-lowing acute myocardial infarction: a prospective serial echocardio-graphic study of 96 patients. Eur Heart J 1983; 4:333–7. 9. Jugdutt BI, Sivaram CA Prospective two-dimensional echocardio-graphic evaluation of left ventricular thrombus and embolism after acute myocardial infarction. J Am Coll Cardiol 1989; 13:554–64. 10. Solheim S, Seljeflot I, Lunde K, Bjørnerheim R, Aakhus S, Forfang K, Arnesen H. Frequency of left ventricular thrombus in patients with anterior wall acute myocardial infarction treated with percutaneous coronary intervention and dual antiplatelet therapy Am J Cardiol, 2010; 106:1197–1200. 11. Osherov AB, Borovik-Raz M, Aronson D, Agmon Y, Kapeliovich M, Kerner A, Grenadier E, Hammerman H, Nikolsky E, Roguin A In-cidence of early left ventricular thrombus after acute anterior wall myocardial infarction in the primary coronary intervention era. Am Heart J. 2009; 157:1074–80. 12. Shacham Y, Leshem-Rubinow E, Ben Assa E, Rogowski O, Topilsky Y, Roth A, Steinvil A. Frequency and correlates of early left ventricu-lar thrombus formation following anterior wall acute myocardial in-farction treated with primary percutaneous coronary intervention Am J Cardiol, 2012, 667 – 70. 14. Martin R, Bogousslavsky J. Mechanism of late stroke after myocardial infarct: the Lausanne Stroke Registry. J Neurol Neurosurg Psychiatry 1993; 56:760-64. 15. Loh E, Sutton MS, Wun CC, Rouleau JL, Flaker GC, Gottlieb SS, La-mas GA, Moyé LA, Goldhaber SZ, Pfeffer MA. Ventricular dysfunc-tion and the risk of stroke after myocardial infarction, N Engl J Med 1997; 336:251-57. 16. Ferreira JP, Girerd N, Gregson J Stroke risk in patients with reduced ejection fraction after myocardial infarction without atrial fibrillation J Am Coll Cardiol. 2018 71(7):727-35. 17. 2017 ESC focused update on dual antiplatelet therapy in coronary artery disease developed in collaboration with EACTS, The Task Force for dual antiplatelet therapy in coronary artery disease of the European Society of Cardiology (ESC) and of the European Associa-tion for Cardio-Thoracic Surgery (EACTS) European Heart Journal (2018) 39, 213–54. 19. Vecchio C, Chiarella F, Lupi G, Domenicucci S Left ventricular thrombus in anterior acute myocardial infarction after thrombolysis. A GISSI-2 connected study. Circulation. 1991;84:512–19. 20. Rubboli A. Efficacy and safety of low-molecular-weight heparins as an adjunct to thrombolysis in acute ST-elevation myocardial infarction. Curr Cardiol Rev. 2008;4(1):63-71. 21. American College of Emergency Physicians, Society for Cardiovas-cular Angiography and Interventions, O’Gara PT, et al. 2013 ACCF/ AHA guideline for the management of ST-elevation myocardial in-farction: a report of the American College of Cardiology Founda-tion/ American Heart Association Task Force on Practice Guide-lines. J Am Coll Cardiol 2013; 61: e78–140. 22. Okuyan E, Okcun B, Dinçkal MH, Mutlu H. Risk factors for develop-ment of left ventricular thrombus after first acute anterior myocar-dial infarction-association with anticardiolipin antibodies. Thromb J. 2010;8:15. 23. Driesman A, Hyder O, Lang C, Stockwell P, Poppas A, Abbott JD. Incidence and Predictors of Left Ventricular Thrombus After Pri-mary Percutaneous Coronary Intervention for Anterior ST-Segment Elevation Myocardial Infarction. Clin Cardiol. 2015;38(10):590-7. 24. 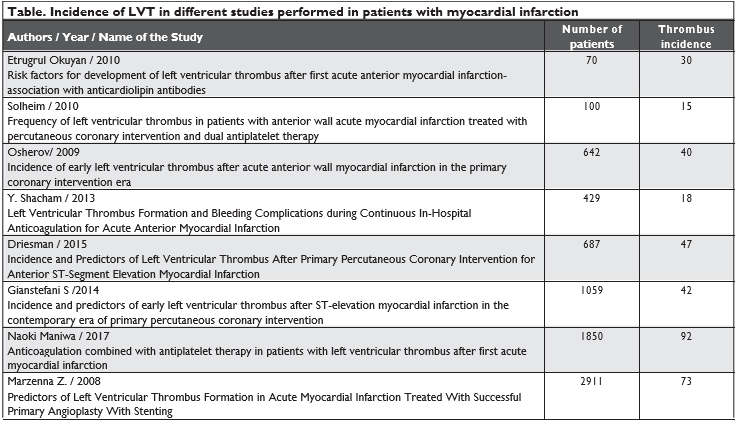 Gianstefani S, Douiri A, Delithanasis I, Rogers T, Sen A, Kalra S, Charangwa L, Reiken J, Monaghan M, MacCarthy P. Incidence and predictors of early left ventricular thrombus after ST-elevation myo-cardial infarction in the contemporary era of primary percutaneous coronary intervention. Am J Cardiol. 2014 Apr 1;113(7):1111-6. 25. Maniwa N, Fujino M, Nakai M, Nishimura K, Miyamoto Y, Kataoka Y, Asaumi Y, Tahara Y, Nakanishi M, Anzai T, Kusano K, Akasaka T, Goto Y, Noguchi T, Yasuda S.Anticoagulation combined with anti-platelet therapy in patients with left ventricular thrombus after first acute myocardial infarction. Eur Heart J. 2018 Jan 14;39(3):201-08. 26. Zielinska M, Kaczmarek K, Tylkowski M.Predictors of left ventricu-lar thrombus formation in acute myocardial infarction treated with successful primary angioplasty with stenting. Am J Med Sci. 2008 Mar;335(3):171-6. 28. Yildirim E, Kalkan K, Ipek E, Demirelli S., Ermis E al. Successful reso-lution of left ventricular thrombus with apixaban treatment. Int J Cardiovasc Acad 2016; 2(2): 57–58. 29. Perez MP, Bravo DS, Trigo JAG, Ruiz de Castroviejo E V., Llergo J T., Cabezas C L, Guerrero JC F. Resolution of left ventricular throm-bus by rivaroxaban. Future Cardiol 2014; 10(3): 333–36. 30. Kolekar S, Munjewar C, Sharma S. Dabigatran for left ventricular thrombus. Indian Heart J 2015; 67(5): 495–96.